Polylast Bunker Liner is thin and flexible so it can easily contour to the curves and slopes of your bunker. It is also extremely durable, even in extreme temperatures. Polylast Bunker Liner retains it’s flexibility and tensile strength in temperatures as low as -40 degrees Fahrenheit, making it a perfect bunker solution for golf courses in locations that have very cold winters, and experience freeze / thaw cycles. This video demonstrates Polylast Bunker Liner’s flexibility, even when frozen in ice. This unique patent pending solution is made in the USA and prefabricated from 100% recycled rubber (US Patent number 8,389,624 B2 issued March 5, 2013) which arrives ready to install. Installation is simple, requiring only the placement of the preformed pads, of which the seams are glued together. This liner doesn’t require any special heavy equipment or any certified installation crews. The material is flexible, allowing it to easily contour to the curves and dips of your bunkers, while being strong enough to withstand migrating animals or the accidental scrapes from machine rakes. Along the edges, Polylast™ Bunker Liner can be placed under the turf, creating a seamless edge while allowing the roots to thrive in the porous material. Additionally, trimming turf edges has never been easier. 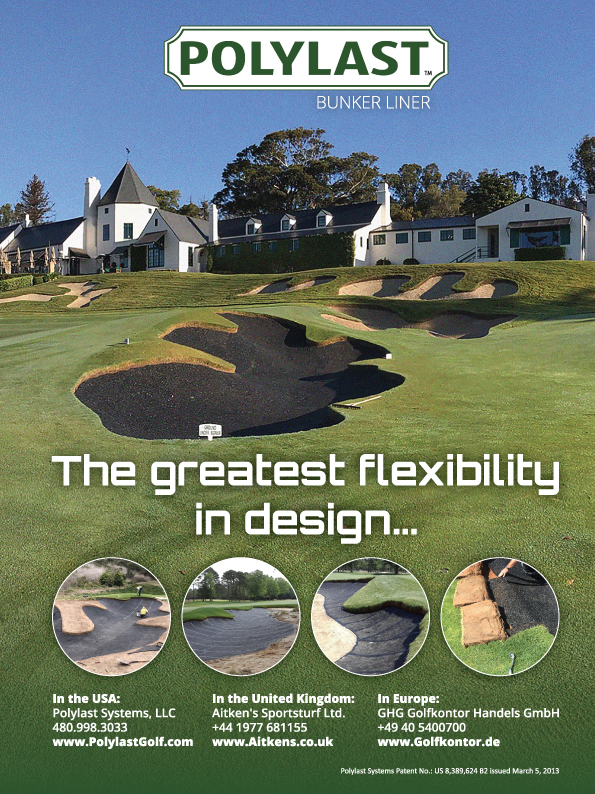 Featured in the Golf Architecture Magazine, this revolutionary bunker liner is a simple, superior solution to what has become a complex issue. For USA and International Shipping and Installations: Polylast Bunker Liner, and Seam Glue, are NOT Hazardous Materials, are NOT Marine Pollutants, and are classified and labeled according to the Globally Harmonized System (GHS).